Getty/Stephen BrashearA worker at the Amazon Go store in Seattle. Amazon is reportedly considering launching product similar to a checking account. In a note to investors, Bank of America Merrill Lynch predicted this would likely be a small boon to e-commerce sales, and wouldn’t affect bank’s business much. The account would likely be targeted to people without bank accounts, which are either young or lower income – an estimated seven million people in the US at last count. Walmart offers services to entice low-income shoppers to stores, like checking-style accounts and low-fee check cashing in stores. Amazon may be going after low-income shoppers in a big way. The company is reportedly working on a program that will produce a product similar to a checking account, according to the Wall Street Journal. Customers could reportedly hold money in the account and take deposits. Neither the customer nor Amazon would likely need to pay a fee for transactions. Amazon is currently in discussion with major banks for the idea, and it may never actually happen. It’s likely not intended to compete with the existing banking industry. “We think [Amazon’s] aim with expanding its financial offering is less about disrupting the financials sector and more about increasing engagement on its own marketplace,” the Bank of America analyst Justin Post said in a note to clients. Instead, the move, should it become a real product, would likely be a play to get some of the few remaining hold-outs for the online platform. There’s still a large part of the US population that is unbanked – that means no checking account, savings account, or credit cards of any kind. That leaves this population – 15.6 million people – without any way to shop online via traditional means. It makes sense for Amazon to launch a program directly aimed at this population, while also reducing fees it pays to banks along the way. It could also make these customers more loyal to Amazon, as Bank of America notes. Amazon has already gone after these customers with Amazon Cash, which allows you to load money into your Amazon account through a convenience store, but the bank account could be faster and easier. Most of these potential customers are younger, or have a lower income than Amazon’s traditionally well-heeled Prime members. 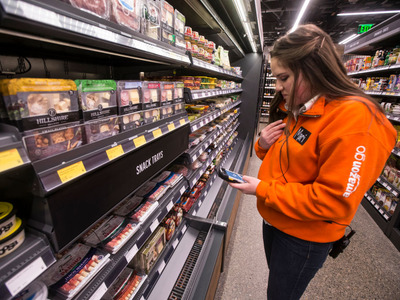 But they spend money too, and as Amazon dives more heavily into its fresh grocery and essentials business, the convenience may drive them to the website. This customer segment has long been Walmart’s forte, and they have their own products geared toward this customer like low-fee checking accounts and money services done in the store like low-fee check cashing and bill pay. In 2016, the chain generated $US13 billion in sales from customers using SNAP benefits- otherwise known as food stamps. Amazon already makes a play for those customers by offering discounted Prime memberships to those with EBT or Medicaid cards, and the company is also testing a pilot program with the USDA to offer SNAP benefits to online shoppers.